Facebook settled a lawsuit last month that could have seen the social network compensate one out of every three users in the US but details of the settlement were only made available over the weekend. Zuckerberg and company agreed to pay $10 million to charity to settle a dispute from five users with regards to the site’s use of “endorsed” advertisements. 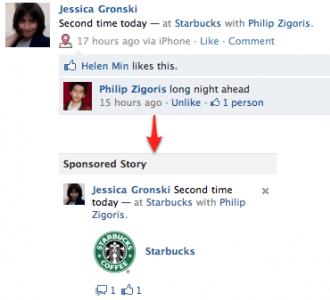 A sponsored story is one where Facebook displays a member’s name and profile photo on a mutual friend’s page as an advertisement with the assumption that said user “likes” the advertiser. The ad could be generated based on checking in at a particular retailer, commenting on a post or liking a product or brand. One particularly embarrassing example involved Nick Bergus. He posted a link to a 55-gallon drum of “Passion Natural Water-Based Lubricant” as a joke on his wall only to discover that the company behind the product selected his profile as a sponsored story. One can only imagine the level of embarrassment that ensued. The users who filed the lawsuit in 2011 claimed the practice violated California’s privacy law. For their part, Facebook argued that a trusted referral was the “Holy Grail” of advertising, worth at least twice and up to three times as much as a standard ad on the social network. Judge Lucy Koh said the plaintiffs proved economic injury could happen as a result of Facebook using member’s information in such a way. "California has long recognized a right to protect one's name and likeness against appropriation by others for their advantage," Koh noted in the judgment. The plaintiffs agreed to an arrangement known as a cy-pres settlement which means that any judgment awarded could be donated to charity. The $10 million judgment is only a fraction of what Facebook could have been on the hook for if the lawsuit reached full class action status.